Ian and I took his children to the gallery and glass blowing studio in St. Meloir des Ondes (between St. Malo and Cancale) today. It was cold so the warmth of the furnaces was welcome. 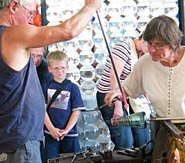 We had to wait about an hour before they started working the glass but once the process began we all enjoyed watching the manipulation and blowing of the hot molten Cristal glass. One piece took about 30 minutes and was achieved by layering hot coloured glass on an already molten bulb of glass constantly blowing and turning. 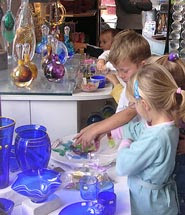 Ian's children are always interested in learning new things and the artisan, Martin Du rand, did include them and ask them if they had any questions at the end. I have to confess to being a bit rigid with fear as enthusiastic spellbound kids looked around the glittering gallery, sleeves and dangling gloves just missing 300 euro objects of art but we did, thankfully, escape without any damage. The gallery also offers workshops for adults and children for those of you who fancy having a go. Another good idea on a cold, wet day.